If you are looking for plot twists and surprises in this flick ... well you might be disappointed. The words in this image on the left (Live. Die. Repeat. ), along with the movie trailers prepare you for the plot of this Groundhog Day kind of story. That said, I found the movie to be very enjoyable. 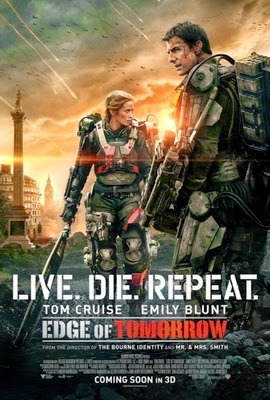 Tom Cruise makes good action flicks and this SciFi thriller is no exception. It is an exciting thrill ride with a bit of self-reflection thrown in. I like the way that Bill Cage (played by Cruise) matured into a different person when confronted with the horrors of war and caring for another person. The movie does a good job developing that character and I think that Emily Blunt does a decent job playing the warrior hero. I thought that it had a pretty good ending and I walked out of the theater feeling pretty good about it. I liked the movie and, on a scale of ten, give it ★★★★★★★★. I really enjoyed it both times I saw it. I also bought the book, which apparently has a different ending. Let me know which you liked better Mike. The book might provide details that were (or not) missing from the movie. We hope to see it soon but we will be traveling the next few weeks. Glad you like it! We saw Chef which was extremely entertaining. Let me know what you think when you watch it Debby. Chef is on my list to see. I loved Groundhog Day too Kevin. Bill Murray hit it out of the park in that movie.